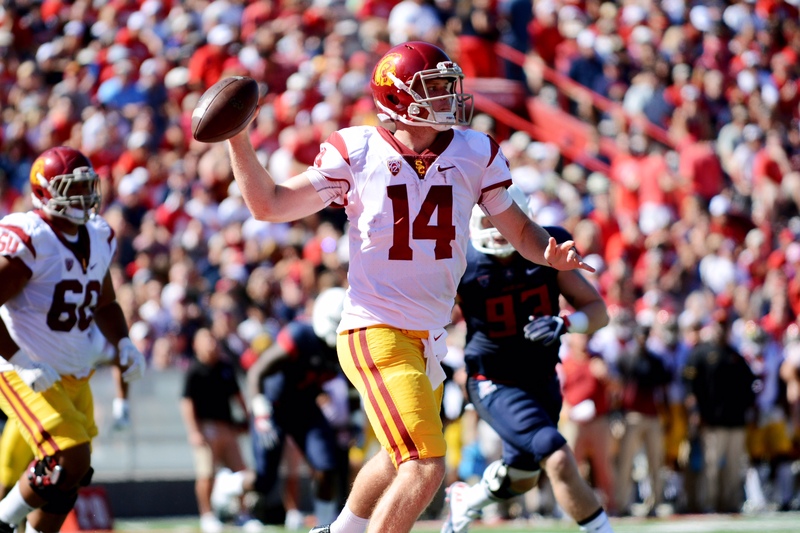 mWith confidence riding high and facing a third-string quarterback, USC came into Arizona Stadium — with the sun beating down on a sweltering Saturday afternoon in Tucson — and torched the Wildcats in a 48-14 rout to improve over .500 for the first time this season. 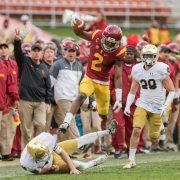 On-field temperatures reached 137 degrees — sophomore running back Ronald Jones II called it “worse than” his hometown of Texas — but that didn’t stop redshirt freshman Sam Darnold from putting together another strong performance, throwing for 235 yards and five touchdowns, and adding on 54 more yards on the ground. 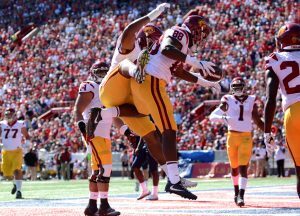 “We really challenged this group to go on the road and give us 60 complete minutes and without question, I think they did,” head coach Clay Helton said. Darold was helped by junior wide receiver JuJu-Smith Schuster, who dazzled with nine catches for 132 yards and three touchdowns. One could say that Smith-Schuster, whose dance video last week blew up on social media, was “on the beat,” with three unanswered scores in the second half to put the game out of reach. Ahead 21-7 in the second quarter, Smith-Schuster scored from three yards out on a screen pass. On the Trojans’ next drive, he ckcked on a nifty 39-yard touchdown after making a catch, tip-toeing the right sideline before breaking though tackles and diving into the end zone. Smith-Schuster said coaches called the play for him to make the catch, get out bounds and stop the clock. But the junior had other thoughts. And he wasn’t quite done. And at the start the second half, the junior rose over his defender to make a leaping grab on a 46-yard connection with Darnold, putting USC in front 41-7. His day ended on a down note, though, as he went down on a play later in the third with an apparent back injury. Smith-Schuster was helped to the sideline but walked to the locker room under his own power. X-rays came back negative, Helton said after the game. With senior running back Justin Davis out, Jones was the featured back and looked to re-assert himself after a rough start to the season. Jones received a steady diet of carries from the start. On the first drive, he rushed six times for 30 yards and finished off a 10-play drive with a 5-yard touchdown run up the middle. The sophomore also had rushes of 10 and 13 yards to put USC in the red zone. He finished with 16 carries for 77 yards. “I was able to get in the flow in the game faster,” Jones said on the impact of starting a game. Injuries also hampered Arizona coming into the game. Freshman Khalil Tate got the start at quarterback for Arizona, with starter Anu Solomon and backup Brandon Dawkins both out. Arizona evened the score later in the quarter. The Wildcats received great field position after a short punt by USC on top of a 15-yard unsportsmanlike conduct penalty. 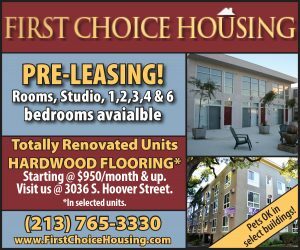 Starting from the Trojans’ 35-yard line, Arizona took five plays to score, with Tate running in a quarterback keeper from three yards out. Tate, though, struggled against USC’s defense, which limited the freshman to just 58 yards passing. He did have 72 yards on the ground, but the Trojans were able to mitigate his strength. USC controlled the turnover battle, forcing four giveaways from Arizona while committing none of its own. That gave the Trojans great field position throughout the game, which the offense took advantage of. 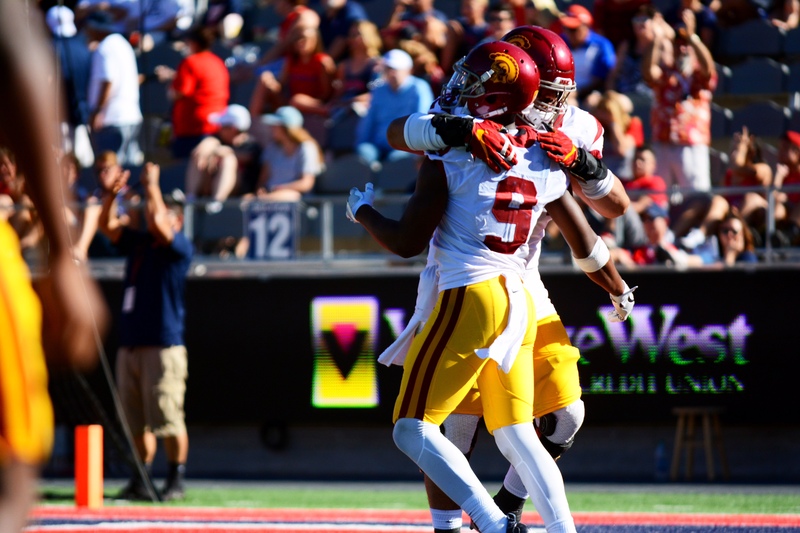 Turnovers proved costly in the Trojans’ rough start, and even in last week’s win over Colorado, USC coughed up the ball four times. Saturday, the Trojans were flawless. “The only way we won’t win out is by hurting ourselves,” Smith-Schuster said. 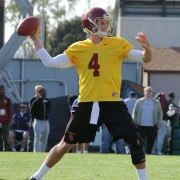 USC re-gained the lead before the end of the first quarter with a drive manufactured by Darnold’s scrambling abilities. The Trojans held the ball for nearly six minutes, converting on all four of their third down attempts. And it was Darnold making the plays, slipping out of tackles and diving for the sticks twice on runs of seven and five yards. He also completed two pass attempts — the second an 11-yard strike to sophomore wide receiver Deontay Burnett after scrambling to his right. Helton lauded Darnold’s ability to keep his eyes downfield even when in scramble mode, which keeps defenses even more on their toes. The Trojans opened up a two-score lead at the start of the second quarter as they were gifted a turnover by Tate. 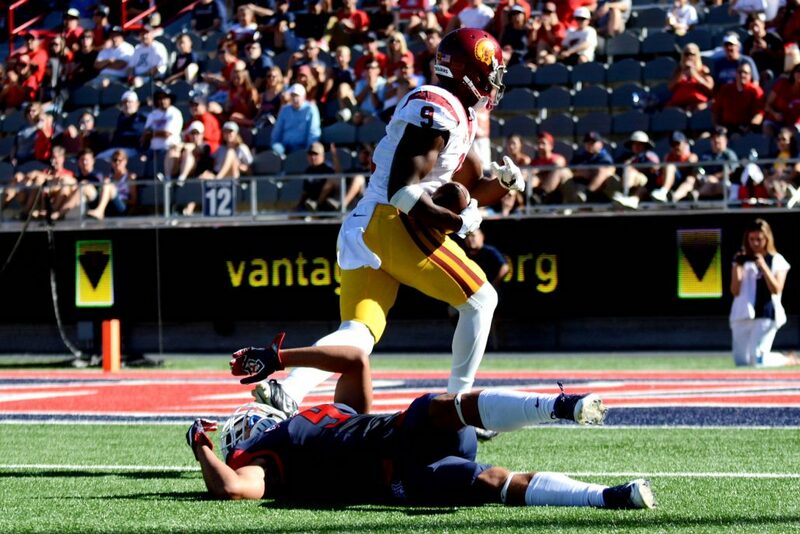 Junior cornerback Adoree’ Jackson picked up the freshman’s fumble and returned it to the Wildcats’ red zone. From there, Darnold lobbed a pass for redshirt freshman tight end Daniel Imatorbhebhe, who made a diving catch with his fingertips to give the Trojans a 21-7 lead. And USC extended the lead thanks to another turnover. 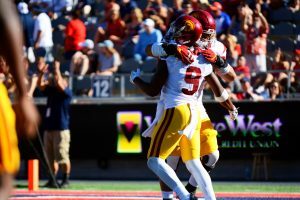 Tate threw a pass right to sophomore defensive back Iman Marshall to set up the Trojans’ deep in Arizona territory again. 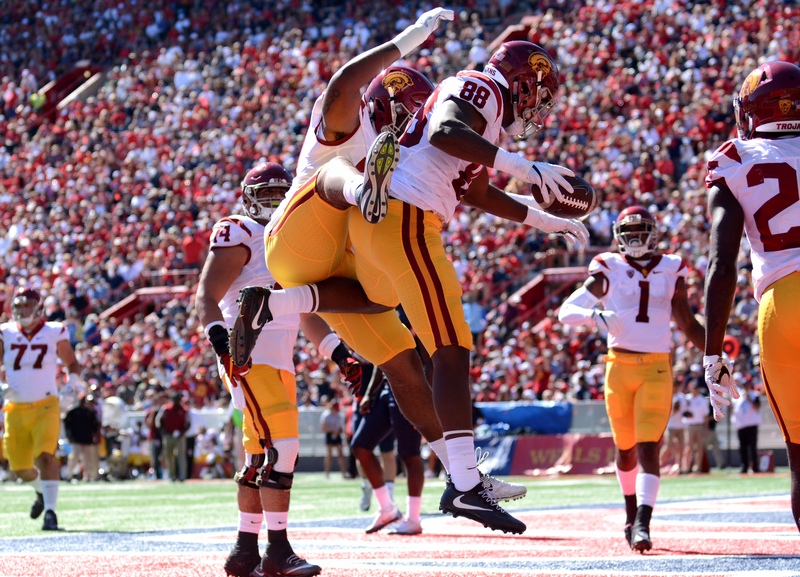 A couple of runs by sophomore running back Aca’Cedric Ware set up a three-yard touchdown connection from Darnold to junior wide receiver JuJu Smith-Schuster. USC led 34-7 at halftime and 41-7 entering the fourth quarter, with the two teams trading touchdowns in the fourth quarter. Redshirt junior Max Browne replaced Darnold in the fourth at quarterback as the Trojans put in much of their second unit to close out the game. Arizona, for its part, all but conceded when it put in a tight end in Matt Morin at quarterback late in the game. As the second half lingered on and all that was missing was the final score, the heat continued to swelter and fans slowly but steadily left for home early from the near-deserted Arizona Stadium, it was a stress-free, picture-perfect win for the Trojans — just what the doctor ordered to keep their Pac-12 hopes alive. 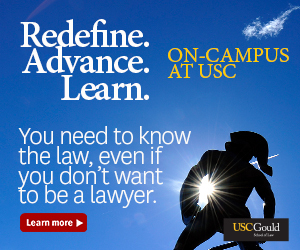 USC has a bye week next week before facing Cal at home the following Thursday. Jones was asked if the morale of the team was improving with each win. This post was updated at 9:19 p.m.